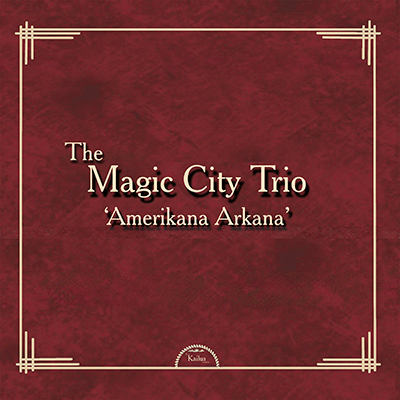 The Magic City Trio take their inspiration from pre-war country music, through to modern hillbilly noir. Using this as a platform to develop their own songwriting resulted in their debut LP ‘Amerikana Arkana’. The album was released last year to excellent reviews. Their songs occupy the world of murder ballads, outlaw stories and songs of loss and dust bowl depression. Buts its not all doom and gloom, most of their songs are up tempo with strong melodies that you could square dance to. Despite the name, the band play mostly as a four piece, with Frank Sweeney (guitar .voc). Annie Holder (guitar voc), Adi Staempfli (Bass), Charlotte Burke (Drums). Ocassionally the will expand the group with a brass section. Singer guitarist Frank Sweeney has appeared on many recordings as a member of classic indie band The June Brides, with other notable appearances on Primal Scream’s Sonic Flower Groove LP and Space Blues by Felt. Annie Holder was a member of Annie and the Aeroplanes who were recently rediscovered on Cherry Red’s C88 compilation. Though based in London, the band have travelled and played in the US (Maui has been their furthest from home) Ireland and Germany. ‘Amerikana Arkana’ is their debut album released April 2018. Their songs occupy the Americana world of murder ballads, outlaw stories and songs of loss and economic depression. What gives the record an epic scale is the heavily orchestrated sound that bears the influence of Ennio Morricone and the psychedelic cowboy music of Lee Hazlewood.